CLASS IS SOLD OUT. JUST SHARING PHOTOS AND DESCRIPTION. 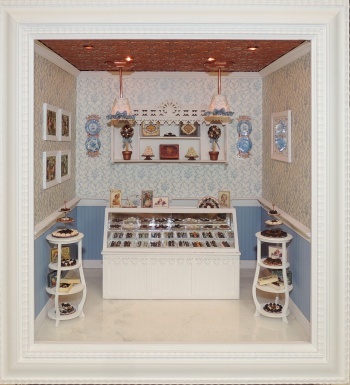 Our newest online class and kit is this wonderful 1/12 scale chocolate shop. This is the only 1/12 scale roombox project we will do this year, but it's a doozie! Pull up a chair while I tell you all about it!! I wanted to do a small, intimate setting for a chocolate shop, which would allow the tiny chocolates to be the star and not be lost in the architecture! This roombox interior measures 12" wide by 10" deep and 12" high. It is housed in a plywood outer box which measures 13.25" x 15.25" x 10.5". The outer box is designed so that students can easily attach a 12" square picture frame to the outside to frame and seal their project. 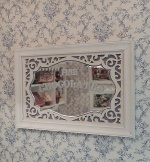 Frames are NOT included as they should be a personal choice for each student. I'll describe the shop and all of the great things you will learn in this project from the floor up. First, my dear friend Moonyeen Moller has shared her talents and will be teaching you how to do reverse painting on plexiglass. The plexi floor will be laser etched to indicate 2" squares. You will learn Moonyeens easy and fun technique to paint a beautiful marbled pattern on the reverse side of the plexi. The finished results are a beautiful glossy floor with delicate marbling, in scale for the project. The back work counter also has a marble top that you will create in the same manner. This is a skill you can use in future projects and you will see how changing the colors can make a totally different look. The walls feature bead board wainscoting with an elaborate chair rail. Above the rail is a lovely blue on white floral wallpaper. The ceiling is a molded "copper" ceiling. There are 6 recessed lights and two pendant lights. We designed and 3D printed the pendant light fixtures. They are covered with matching wallpaper, trimmed with silk ribbon, and hang from copper tubing. The ceiling comes to you completely pre-wired. All you need to do is cover the pendant lights and attach two wires and you are done!!! Above the counter, on the back wall is a coordinating shelf unit. The design for this unit was adapted from an original Victorian overmantle. 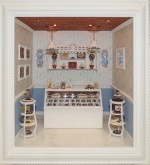 The fretwork and engraving is beautiful, and it is a great place to display those chocolate treasures. Behind the main counter is a work counter. 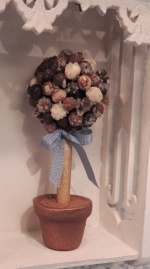 This one has a "marble" top to keep the chocolates nice and cool. On the counter sits my original 3D printed candy scale. A darling cash register is on the opposite end of the counter. And yes, all of these items are included in the kit. Remember our saying "If it's in the photo, it's in the kit?" While that can be a bit more of a challenge in 1/12 scale, I am very proud to offer you a kit that contains everything shown and more, all original designed features and fixtures and for an affordable price. 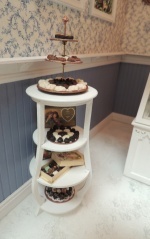 The two four tier display units in the front are also included, as well as a lovely fretwork framed, engraved wall mirror and four beautiful framed prints featuring antique Victorian children making chocolates. 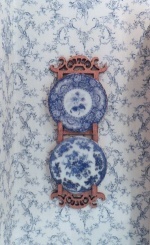 On either side of the back wall shelf there are two "copper" plate hangers each displaying two delicate porcelain plates which you will decorate with water decals in an antique blue transferware design. You will receive FIMO to make all of the chocolates in the shop and then some. 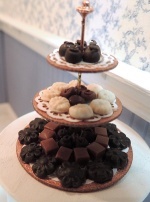 You will learn to make hand molded chocolates like those on the bottom row of the candy counter. You will also receive TWO silicone molds. The first includes molds for over a dozen beautiful tiny highly detailed pieces from hearts and flowers to stars and leaves. The second mold will allow you to make truffles. 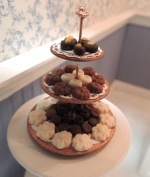 You will learn to blend the appropriate colors for making realistic chocolates, You will learn to make hand modeled and molded chocolates and how to trim them in a vast number of methods. You will make nuts, coconut, cocoa powder and other coatings. You will learn to make your chocolates in consistent and accurate scale. In addition to the FIMO you will receive a tool kit including modeling tools, roller, clay cutter, and round punch tool. All you need to provide is a tile and an oven to cure your fimo. The kit also includes lots of darling laser cut candy boxes to assemble and fill. Most feature antique artwork and are my original designs, and all are just darling. Students will provide basic tools, such as scissors, ruler, Xacto, paint brushes, etc. They will also provide paints, glues, and acrylic sealer. Paint brands and color numbers will be provided for you for easy shopping . Class size is limited, and NO registrations will be taken once registration closes. My classes always sell out, and I always have emails after the registration closes asking me to please "take just one more" student. Because of the labor involved and the supplies we need to gather for this project, we will NOT be taking any additional students after registration closes so please don't wait till the last moment to register.... it might be too late. Be sure and check out the photos below and if you have any other questions, drop me an email. Thanks for reading!